If you feel stuck — in a relationship, in your career, at home — chances are a crucial conversation is keeping you there. 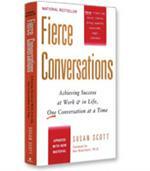 The summary of this New York Times bestseller will help you handle crucial conversations — conversations that occur when the stakes are high, emotions run strong, and opinions vary. With crucial conversations skills, you'll be able to: prepare for high-stakes situations with a proven technique; transform anger and hurt feelings into powerful dialogue; make it safe to talk about almost anything; be persuasive, not abrasive; improve nearly every professional and personal relationship; and yield major professional improvements in areas like productivity, quality, safety, diversity, and change management. How to prepare for high-stakes situations with a proven technique. How to transform anger and hurt feelings into powerful dialogue. How to be persuasive, not abrasive. 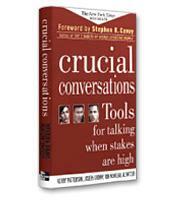 How new techniques, skills and tools work together to enable successful crucial conversations.